A Reciprocating Saw is a handheld saw commonly used for demolition and remodeling. You can use it to cut through many types of materials such as wood, metal, PVC and nails. Get ready to tear the house down! Take a look at the introduction video and browse around to learn more about how to master these useful saws! Make sure the shoe is firmly against the material during cutting. Use different parts of the blade by adjusting the shoe. If your saw has an adjustable shoe feature, adjust the shoe to use different sections of the blade. This will allow your blade to last much longer! Your saw can be used upside down. Insert the blade upside down but always hold saw right side up for a firm grip. This will allow you to accomplish cuts at tricky angles. Make faster cuts in wood with orbital action. Some saws include orbital action. This feature makes a faster, more aggressive cut with a rougher finish. This should only be used when cutting wood. Don't force the blade through the material. Use only enough pressure to keep the saw cutting. Let the blade and saw do the work. Keep pressure on the shoe, against the workpiece. A feature that allows the user to move the shoe forward or back, exposing more or less of the saw blade. Instructions: Adjust the shoe forward or backward depending on how much blade length you want to use. Remember- shorter blade length is easier to control, while longer blade lengths can go deeper into materials. Bi-Metal blades are manufactured with two types of metal. This provides a much stronger, longer lasting blade. This is the part of the saw that holds the blade in place. Most blade clamps are tool-less and spring loaded. Instructions: Unplug or remove the battery pack from the saw, then pull back (or lift up) the blade clamp. Insert the blade, and release the blade clamp. Make sure the blade is secure. You should never operate a saw with a loose blade. Instructions: Using a long-length flexible blade, bend the blade until it curves with part lying flat on the surface. Pull the trigger, and the bent blade will cut the nail/screw flush against the material. The unexpected action of the saw hurling the material being cut or the saw in the direction of the user. An additional setting on some Jig Saws and Reciprocating Saws that provide an orbital action for more aggressive cuts. Instructions: Only use this function on wood- never metal or plastic. A feature that allows you to rock the saw back and forth during cutting without lifting the shoe off the cutting material. This helps you get through tougher cuts. Instructions: Without the blade touching the material, rest the shoe of the saw on the material. Pull the trigger and slowly lower the blade into the material until the blade fully enters the material. Cutting a square or rectangle shape out of the material; may be used for creating a space for electrical outlets. This is the part of the saw that rests against the material you are cutting. The shoe should always be flat against the material. It reduces vibration and gives you better control. Instructions: Rest the shoe against the material before pulling the trigger. The blade should not touch the material until moving at full speed. Once the shoe is in place, you can start the saw. TPI stands for Teeth Per Inch. This is the way saw blades are measured. The lower the TPI, the more aggressive the cut. Instructions: If you're cutting wood, choose a 6-10 TPI blade. For metal, choose a higher TPI such as 18. Allows user to control the speed of the blade. This feature gives the user greater cut control. Instructions: If you're sawing and you hit a particularly hard patch of material, simply adjust the speed of the saw to help you get through it. Any power tool can be dangerous if it is used improperly. If you follow all the safety directions in your manual, you should be able to use a reciprocating saw safely. Read and understand your manual before using your reciprocating saw. What can I cut with a Reciprocating Saw? All kinds of wood as well as masonite, plastic, drywall, sheet steel, pipe, steel rods, aluminum, brass and copper. 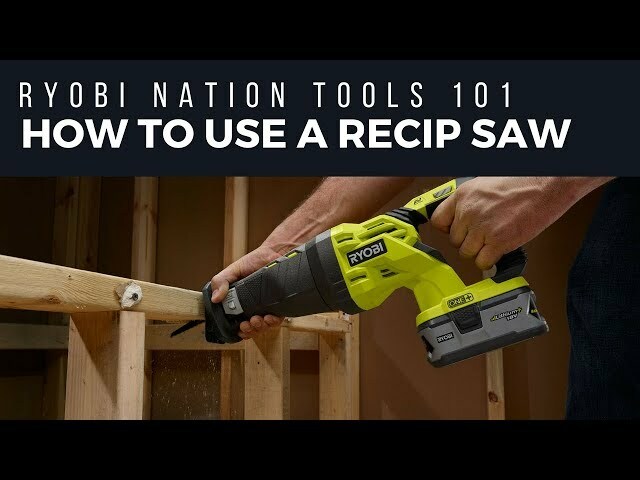 How do I know when to use a Reciprocating Saw? Usually for demolition, but you can use it for making any rougher cuts when precision is not as important. You can also use a reciprocating saw for pruning trees (a pruning blade maybe needed). Consider what you are cutting and what TPI is appropriate for the job. Lower TPI (Teeth Per Inch) are usually used for wood, mid-range TPI is best for plastics, and high TPI is recommended for metals. 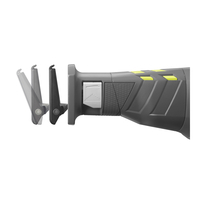 Check the recommendations on the blades' package to know for sure. How can I make plunge cuts easier? Drill a pilot hole large enough to insert the blade. This will make it easier to start. Can I use a Reciprocating Saw instead of other kinds of saws for building? Recip saws make rougher, less precise cuts. It's best used for demoltion. What kind of blade should I use to cut wood with nails in it? Demolition or Multi-purpose blades are good to use when cutting through nailed wood. Can I cut a tree with a Reciprocating Saw? You can cut branches and limbs with a reciprocating saw. If your tree is small enough, you can cut a tree down. Bear in mind, these saws are ideal for cutting stationary material. If there's a lot of give to your branch or limb, the saw may just shake it rather than cutting through it. Use Caution.